Do you ever clean out your dishwasher? What? Why would a dishwasher need cleaning?? Save yourself a repair bill! 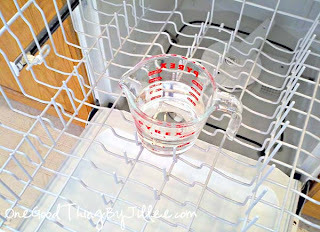 Place a dishwasher-safe cup filled with plain white vinegar on the top rack of your dishwasher. Using the hottest water available, run your dishwasher through a cycle – except for the cup of vinegar, the dishwasher needs to be empty. The vinegar will help to wash away the loose, greasy grime, sanitize, and help to remove the musty odor. After using the vinegar to sanitize the inside of the dishwasher, sprinkle a cupful of baking soda around the bottom of the tub and run it through a short but complete cycle using the hottest water. The baking soda will help freshen the smell of your dishwasher as well as brighten up the look of the inside of your appliance by removing stains. Sally Bradway posted: I put 1 cup of vinegar in each load of dishes I have. I just pour it in and have a Cascade tablet in the dispenser. This is the only thing that keeps my dishes spot free and keeps the dishwasher clean too. Don N Bridget Cyrus posted: We have an old favorite coffee cup with the handle broken off and a nice chip off the lip. We keep it on the bottom shelf, and only fill it 1/2 way per each washing.